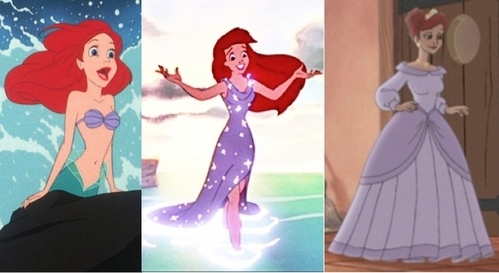 I'm not sure, but I would say purple since that is the color she chose to wear as a mermaid and it is also the color of her dress when her father transforms her back into a human. Also, she wears a purple dress in the sequel. The blue o the rosado, rosa dress were when she couldn't speak, so maybe Eric just had someone pick them out for her to wear. I think purple. Because her seashell bra was purple.